Fans of science fiction will remember HAL, the seemingly sentient computer assistant that played a key role in the film 2001: A Space Odyssey. Thanks to the recent advancements in smart speaker technology and intelligent personal assistants, consumers can enjoy many of the benefits offered by science fiction robots, without the threatening personalities. Smart speaker devices such as Google Home and Amazon Echo pair with intelligent personal assistants such as Google Assistant and Alexa to carry out commands, search the web, and control other smart devices. The industry is rapidly expanding, with market revenues eclipsing 4.4 billion U.S. dollars in 2017 and market revenue projections of over 17 billion in 2022. The two most popular brands in the smart speaker market are Amazon’s Echo/Alexa and Google Home/Google Assistant followed by smaller brands like Alibaba, Xiaomi, and Apple, whose HomePod made its debut at the beginning of 2018 and has been trying to catch up in the game. As consumers have become increasingly open to the idea of integrating smart technology into their households, smart speaker sales have skyrocketed, growing from around 800,000 in 2015 to over 26 million in 2018. Growth in the smart speaker market is increasing at a faster rate than that of other smart home devices, which shows that people trust the technology and find it easy to adopt. 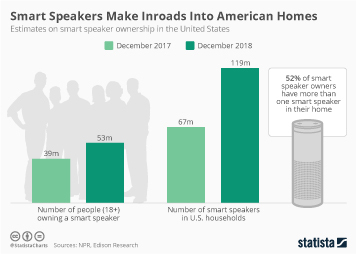 As of February 2018, around 17 percent of people living in the United States owned a smart speaker. The increasing use of the voice assistant technology found in smart speakers is not just a phenomena in the United States. Ownership rate is steady increasing in many countries worldwide, such as China, Brazil, and India. Price seems to be the single largest factor in the decision about whether or not to purchase smart assistant devices, followed by compatibility and accuracy of the device’s voice recognition technology. Seventy-nine percent of smart speaker owners state that they are satisfied with their product and would buy it again, and 59 percent rate their experiences with smart speaker devices as “excellent”. It’s clear from these results that people are finding this technology useful in many aspects of their everyday lives and not viewing it as a superfluous piece of technology that they could do without. The market for smart speakers is growing quickly and the technology involved is steadily improving, but how exactly are people making use of these devices? Fifty-two percent of smart speaker owners state that they mostly use their smart speaker in their living space, while 24 percent say that they mostly use it in their kitchen. Seeking information/news is the most common use of the device, with 82 percent of owners stating that they use their smart speakers for this purpose. As consumers begin to trust the devices more and more, they have begun to adopt more complex uses such as booking tickets, shopping, and even hailing taxis.